This was to big show-winners in the early 90`s and mid 90`s. Frode Algrøy with his very nice 58 with a lot of cool period-correct options. Frode still got this car, and some other high standard vintage VW-cars. You can go vistit Frode. One another prizewinner for the same period was Ulf Kaiser in his junglegreen 56 oval. We have not seen this car for a few years, but guess that Kaiser still got it, someone got any other tips about that? 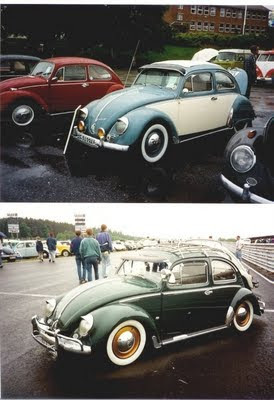 We can also mention Mr. Aandal and his 61 and 56 Karmann cab as great prizewinners in Norway. We know of both of this cars today. The 61 is in the West of Norway, and the cab is in its very best hands. Pictures is from Splitboys old album.